We can learn a lot from geese. 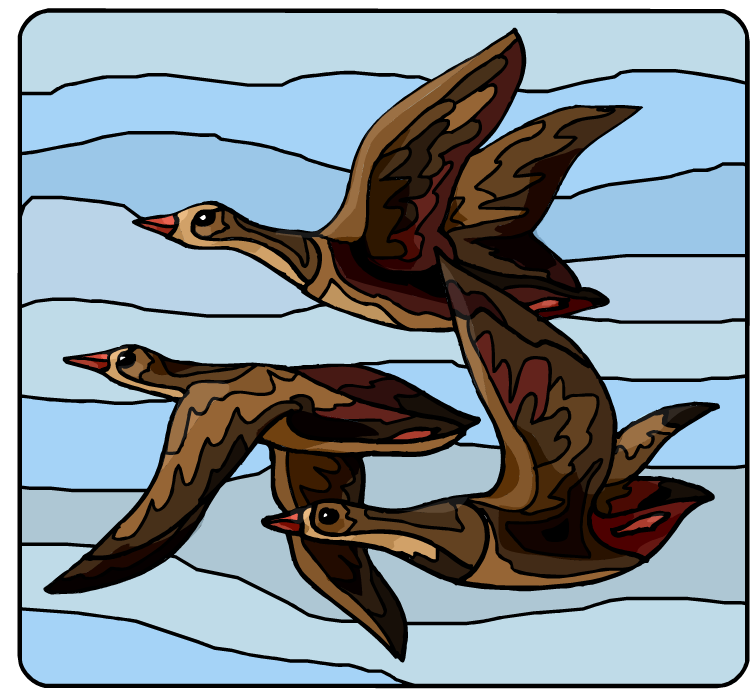 For example, most of you may probably know that when geese fly they fly in a “V’ formation. But have you ever wondered why? Recent scientific studies give us the answer. It has been learned that as each goose flaps its wings, it gives a lift to the one immediately following. It has been determined that flying this way givers the geese about 70% more flying range. Of course, that means that the lead goose is working harder. When the lead goose gets tired, he falls back into the formation and another takes his place. Now, that’s team work! If you have ever seen a flock of geese flying, you have also noticed that all the time they are flying, the geese are “honking.” They do this to encourage one another. It is always easier to do something difficult when you know you aren’t flying alone, isn’t it? Sometimes a goose becomes sick or is injured and falls to the ground. When that happens, two other geese go down and stay with it until it is well. They join another formation and continue on their journey. What lessons do you think we could learn from the geese? We could learn that it is important for all of us to share the responsibility no matter what type of work we are involved with, be it in the Church, in the community, even in business, rather than letting the same loyal ones work until they drop! When there is an attitude of shared responsibility, we do not looks at one another as competitors or enemies, but as fellow creatures created in God’s image and likeness. This is the joy of team work! We could learn that it is important to “honk” encouragement to other co-workers who are struggling along with us. Encouragement, appreciation, praise, all give people a sense of pride in whatever they are doing, and, when they feel encouraged or are praised, they are bound to give off more than they could even estimate of themselves. We could learn that it is important for us to look after those of us who are in need, who need that extra dose of encouragement, sometimes even a little “resourceful push.” Not everyone is blessed with resources to deal with situations. Those of us who are can make our time, our advice, our talent, and at times even our finances, available to help strugglers on their journey through life. There is a lot we can learn from the goose, isn’t there? Reprinted from The Link (July 2011), the monthly newsletter for the Diocese of Agartala, India.